This article contains a brief review of the main tourist attraction in Shanghai. For every attraction we’ll also specify the address and closest metro stop. Here you’ll find an interactive map of the Shanghai metro, while here you’ll find our guide designed for those who wish to move to Shanghai. To conclude, here you’ll find our reviews on the best hotels in Shanghai. Note: in this article we indiscriminately use the words “Road” and “Lu”. The meaning is the same, since both have the meaning “way” or “street” (the difference is that the first word is in English and the second is in Mandarin). Yu means “peace” in Chinese. The Garden of Peace was conceived by Pan Yunduan, an official of the Ming Dynasty, so that his parents could spend their old age in happiness. The Garden is located in the center of the old city of Shanghai, a few blocks south of the Bund. The garden spreads across a large space, including a pair of halls and other buildings of note, and could compete with the famous gardens in Suzhou. The only problem? It is extremely crowded. Located in the center of Shanghai, between East Nanjing Road and West Nanjing Road, the square extends across a surface of about 140.000 square meters and hosts various shopping malls, the Shanghai Museum and the Shanghai Grand Theatre. It also has a park that wouldn’t be anything special if not for the fact that this is where the Sunday singles market is held, which is an unmissable spectacle for those hoping to learn more about Chinese culture. The Bund (or Wai Tan, which in Chinese means “the other beach”) is the area located across from the Huangpu River, at Puxi, in the center of Shanghai. This is a pedestrian embankment from where it is possible to admire the famous Pudong Skyline, including the Oriental Pearl Tour and the most impressive skyscrapers of the city; moreover, the Bund faces a series of buildings going back to colonial times, which are found on the other side of Zhongshan Road, compared to the embankment. While during the day it’s the most visited tourist location in Shanghai, at dawn it transforms into the preferred destination for the many practitioners of Tai Chi. Located in the Jing’An district, teh Jade Buddha Temple was built in 1882 to host two per valuable Buddha statues (in white jade) brought by a monk returning from Burma. The temple was destroyed by the civil war that ended the Qing Dynasty. Fortunately the statues were saved and held in the temple that was rebuilt in 1928, and can be visited even today. The old French Concession, as it was called in colonial times, is found in the center of Shanghai. Its borders are rather “blurred”, personally I think it is bordered on the north by Yan’An Road, to the south by Huaihai Road, to the west by Huashan Road and to the east by the Huangpu River. This is the perfect area for those looking to do some shopping or lose themselves in Shanghai’s nightlife, and we’ll speak of this elsewhere in this article. In this section though, we’ll talk about Longtangs (弄堂), a local term referring to Lilong (里弄), or the alleys that grant access to a myriad of old two-story apartments. These are residential neighborhoods, which at night are protected by large iron gates. Personally, my favorite Longtangs are those of Maoming Road, Julu Road and Nanchang Road. Address: bordered on the north by Yan’An Lu, to the south by Huaihai Lu, on the west by Huashan Lu and on the east by the Huangpu River. A great man of Chinese history, he gave his life to the revolution of 1911 and the Republic, Sun Yat-sen is universally well-loved in Chinese history (even in Taiwan and Hong Kong!). In this home lived the young bride Song Qingling up until her death. It is in 30’s style, at certain places perfectly conserved. Inside is the account of this first great man of the Chinese state. Jing’An Temple, which literally means the Temple of Peace and Tranquility, is a Buddhist temple located in the center of Shanghai, north of the French Concession. The temple, built in 247 before Christ, during the period of the Three Kingdoms, was originally found near Suzhou Creek. In 1216, during the Song Dynasty, it was moved into the position where it is now. At least from the outside, it is one of the most interesting temples of Shanghai, especially at night, due to the many lights that decorate it. Inside you’ll find a giant bell going back to the Ming Dynasty, various statues of Buddha, and paintings of masters Chu Zhishan, Zhang Daqian and Wen Zhenming. If you’re looking for the largest and oldest temple in Shanghai, then go see Longhua Temple. In particular, don’t miss visiting Longhua Pagoda, in octagonal shape, which is just outside the temple. Longhua like the following Cathedral of Saint Ignatius, is among the locations used in Spielberg’s film Empire of the Sun. How to get there: Lines 3 and 12 to the Longcao Rd stop. This massive Gothic building had a large importance to the city, being considered the main center of Catholicism in southern China. Historically the cathedral of Saint Ignatius is also considered the birthplace of Xu Guangqi, a student of Matteo Ricci. It was an extremely prosperous and active Jesuit center, even being called at times the “Vatican of China”. This small museum is in the rebuilt Xintiandi neighborhood. Shikumen is a classic example of an old Shanghai home, just as the hutong is for Beijing. The Shikumen were the types of homes that populated Shanghai since the mid 1800’s; first occupied by the local population, slowly they became of interest of the Shanghai wealthy. Today tourists can admire the typical residences at Xintiandi, and the other famous neighborhood in Tianzifang. The Shikumen Open House hosts a small museum where the lifestyle of the time and the use of the houses’ space is illustrated. How to get there: Linea 1 to the South Huangpi Rd stop. This building was an unknown old house that history has consecrated as one of the most visited sites in China since, in fact, it was the seat of the First National Congress of the Chinese Communist Party. It’s very close to Xintiandi and has been carefully restored and used as a museum. There’s no better option for enjoying both amazing skylines that face the Huangpu River: one modern, technological and lit up like a disco on the Pudong side; the other historic, elegant, nostalgic and well-decorated on the Bund. 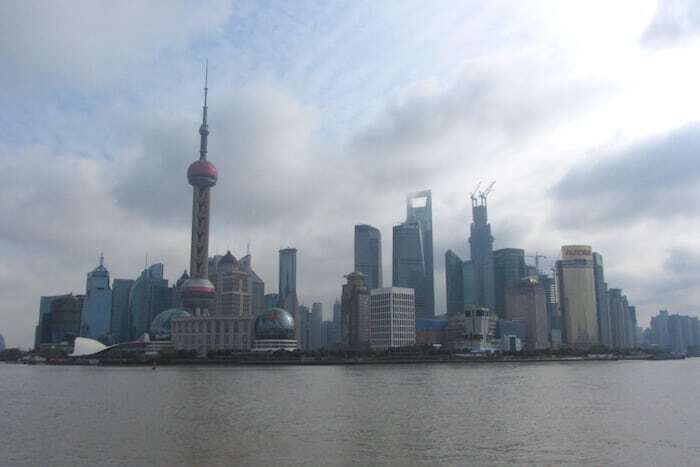 A cruise allows you to see these magnificent buildings of the colonial times head-on and close-up, among which are: the Bank of China, Development Bank, the Peace Hotel, the Shanghai Custom House, the Rockbund Art Museum and even the Waldorf Astoria. On sunny days it’s a nice diversion to enjoy the breeze on the river, while in the evening it’s the time for couples, embracing and enchanted by the lights of the buildings at night. This underground walkway crosses the Huangpu River and connects Puxi to Pudong. It’s a highly advertised but overrated attraction; so it’s better to consider it another way for reaching the other side of the river or a diversion of…little lights, more suited for children. Waibaidu is a massive and historic metal bridge which crosses the confluence of Suzhou Creek and the Huangpu River. A historic stronghold of Shanghai that has known colinization, conquests, battles and rebirth, Waibaidu Bridge crosses an excellent position for enjoying both the Shanghai skyline and the buildings of the Belle Epoque: in particular, the Russian consulate, the Astor House and the Shanghai Broadway Mansion. The Oriental Pearl Tower is also known as the Shanghai Television Tower: a building the decidedly goes against the current in terms of style compared to the archi-star modernity of the skyline’s other skyscrapers. It was long a symbol of the rebirth of Shanghai; today it’s an unmissable roundness of Pudong, that reinvigorates the night. It does hold a trophy as the third highest television tower in the world (468 mt.). There are three terraces, corresponding to the spheres. Once the roof of the city, today it is surpassed by the World Financial Center and the Shanghai Tower: The Jin Mao Tower, passing 420 meters, still remains one of the highest buildings in the world. It hosts the Grand Hyatt which along with the Park Hyatt of the World Financial Center it is literally a bed in the clouds, and among the highest in Shanghai. The tower has 88 floors and is its address is even number 88, so it is protected by good luck according to Chinese tradition. The 360° views from the eighty-eighth floor are worth it on clear days; if it’s cloudy, even just the trip up the elevator to reach the top is a super technological and futuristic experience: 9 meters a second, and in 45 seconds you can get higher than a hilltop! The efforts of Jin Mao to relaunch its height over its two nearby taller sisters have led them to create last year a nice activity for those who don’t suffer from vertigo: for 388 Yuan you can reach out over empty space by walking the glass catwalk that circles the last floor while safely harnessed for breathtaking selfies! This is the Big Brother of all of Shanghai’s skyscrapers. Shanghai Tower was for years highly-photographed just for the advancement of it’s construction which roused much interest. Now it is an integral part of the metropolis’ skyline, and what a part! It is the second tallest building in the world (aat least for now), 632 meters of twisting spiral that pokes holes in the clouds and is often lost in them. It is only surpassed by the Burj Kalifa of Dubai. The tower is the result of a massive work of construction engineering that has been firmly anchored to the ground by some 980 pylons. Here too you can go up to the top at supersonic speeds: 119 floors in 55 seconds! Another tower, another trip around the clouds. The SWFC is a 492 meter high building with a characteristic architecture, offering a glass catwalk – the highest in the world – at 474 meters: the entire 100th floor was built to allow tourists (paying a steep price for entrance and use of the elevator) to walk around and see the immensity of Shanghai below. Its characteristic bottle-opener shape has more than just an aesthetic value, as it also lessens the effect of the winds up there. 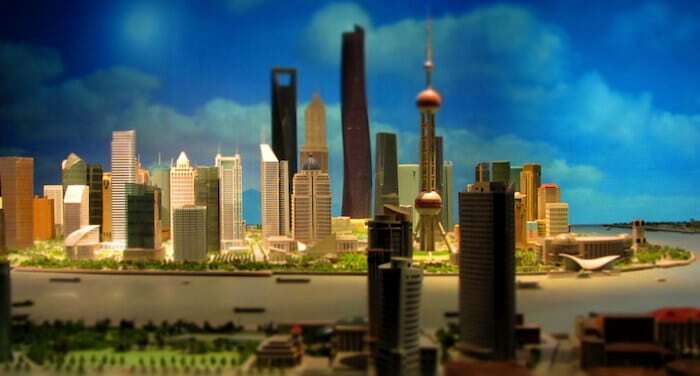 The tour includes a video, a light and color show on the theme of Shanghai of the future, although without a doubt the greatest attraction for most is a tour of the 100th floor. A refined alternative is the Park Hyatt restaurant, on the 91st floor (which is reached by a different elevator, located on the south side). The Maglev is one of the top means of transport in terms of speed and efficiency. 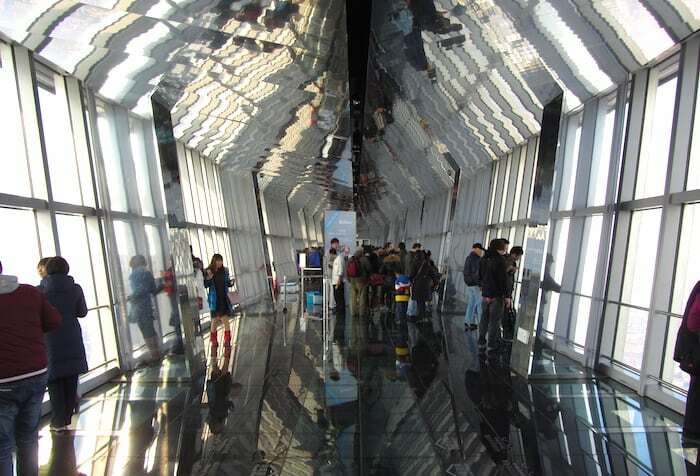 It’s not by chance that it was Shanghai to host this magnetically levitating train that connects Pudong airport to the Longyang Road station in 7 minutes and 2 seconds. It has average speeds of 300 km/h, but in rush hour it can go even faster! For the small price it is worth the experience. How to get there: There are no intermediate stops, you can get on or off only at Pudong International Airport or Longyang Rd. station, both served by metro line 2. Line 7 also goes to Longyang. Qibao is a village on the outskirts of Shanghai, and you won’t have the leave the metropolitan area to get there. This is one of those “water cities” so popular in this area and therefore different from the rhythms and views of the city. In particular, this is the only one in the Shanghai area. It is conveniently connected to the city by metro. You buy an all-inclusive ticket that gives you access to all the historic scenes. A pleasant escape. Like Qibao, Zhujiajiao is one of the four water towns of Shanghai. Still well-maintained, it is called the Venice of Shanghai. Sadly it isn’t easily connected, and it’s necessary to take a bus to get there. There’s no entrance ticket as in the last case, but individual tourist sites each have their own entrance fee. The most popular way for visiting Zhujiajiao is by participating in one of the many water tours on typical semi-covered boats. You can’t fully experience Shanghai if you don’t do a little city shopping. In this nerve center of China goes from best to worst, the most expensive to the cheapest. You could choose to allow yourself to be served and revered in the boutiques of the large markets or battle to the last cent in the depths of the fake market. And you can do so on the same day, in the same clothes. As the name says, this bazaar has “a little of everything” located near the Yu Garden. It’s very crowded even with locals because you can find the truly impossible here. Moreover there’s a lot of little shops where you can taste Chinese snacks (小吃) and typical dishes. If the bazaar isn’t enough for you, you can move on to shopping on Shanghai Old Street which runs west next to the Yu Garden neighborhood. In the area of the Yu Garden Bazaar, Fuyou Market, which on the weekend is incredibly crowded, offers antiques that are real and…fake. The best time to go there is on the weekend and preferably in the early morning, before the best pieces fly off the shelves. This is a place for enthusiasts and connoisseurs because scams are frequent and haggling over prices is required! This market with more than a hundred shops is the home of antiques. Not just on the main road, but all the little streets that branch off are filled with sellers with really ancient pieces and modern pieces that are now antiquated. Yes, objectively unless you’re a connoisseur you won’t avoid being cheated: Chinese merchants know a little more than the devil! The long pedestrian road that hooks People’s Square to the Bund riverside, is one of the most visited areas of the city. Perhaps it’s not the best place for shopping, but for sure on Nanjing lu you’ll find all the single-franchise stores you can imagine. Moreover, there are shopping malls on more floors dedicated to specific shopping categories (sports, kids, luxury, etc. ): among the most reknown, Shanghai n°1 Department Store and Shanghai First Foodhall, which hosts local delicacies. At least 1.5 kilometers of the artery are completely for pedestrians and an electric train crosses it to facilitate the trip. Note that the road is divided into Nanjing Dong Lu and Nanjing Xi Lu, where the latter is less architecturally spectacular, but for shopping it’s an indistinct flow of heads passing by the stores. You’ll certainly be approached by curious people that will generally try to sell you name brand watches and bags: they are all fakes, high quality, but imitations all the same. Ignore them if you’re not interested: they’re not usually dangerous, though a little shifty. N.B. : The famous Fake Market of Nanjing Road (580 Nanjing Xi Lu) closed in June 2016. One goes to this completely rebuilt neighborhood for high-demand shopping. Starting with a coffee and ending with an alcoholic aperitif in one of the many bar-pubs with space to sit, the night comes alive with elegant meetings. Xintiandi is an example of modern reconstruction in an ancient district composed of shikumen: a pleasant place to take a walk or the enjoy international dinners. This is without a doubt one of my favorite places in Shanghai. Tianzi Fang, or even Taikang Lu, is a interwoven maze of dense, colorful alleyways filled with shops, delicious cafes, noisy and intimate little restaurants covered by a host of electric wires that are everywhere in old Shanghai. It is here, despite the vast reconstruction designed for tourists, you can still breathe in a little bit of the atmosphere of the past that the tall shikumen contained. It was once an artists’ district as a result of the French Concession, and looking closely you can still find galleries, showrooms, local artisans and especially artists at work. Look up to admire the mixed architecture, a fusion of local and European tastes. If you don’t like getting lost, the best thing to do is consult a map in advance. Or, just give in right from the beginning, let your curiosity guide you and don’t plan anything else for the day! Just like the name says, it is a jewel market. But on its first floors, the Hong Qiao New World Pearl Market is also an extensive fake market where you can still find souvenirs. My recommendation: bargain to the extreme, get prices down to the point of pretending to leave, and don’t give in a cent! The material market South Bund Fabric Market is not just the best place for finding good materials, but almost every seller also has an onsite tailor. So you can buy the material and have a suit made all in the same (enormous) building. Men’s shirts and suits are popular as are cashmere wool and the traditional qipaos: I recommend, that if you really want a ladies Chinese dress, make sure it is made to your measurements. In fact, unless you’re not a size 40, 38 or lower, the classic Chinese dress will likely be tight on your sides and ridiculously suffocating on your chest. It’s better to allow the tailors to model the dress to the Western shapes. Tailors can copy any style if you bring them a model or even a design with a good explanation in Chinese. Make sure to verify the material since mediocrity is widespread. This appointment on Fridays is a special occasion for coming into contact with the Uigur community in Shanghai. At the Muslim Street Market I especially recommend that you go to taste the specialties of Muslim cuisine: lamb obviously, but also filled sandwiches, naan and noodles. However, the colors of the booths and merchants are a perfect subject for fans of photography looking for something other than the cement of the city. Strong odors and hung butchered meat: this is a warning for those with weak stomachs! The Qipu bazaar is the largest hub in Shanghai for cheap (really cheap) clothing, of low quality and infinite variety. There’s no exact number of sellers and is surely the best place to put together an original carnival costume. But yeah, look, I wouldn’t recommend you go here to renew your wardrobe. Also, lately it seems it has become less safe than usual. The Xujiahui district specializes in electronics. In this area you’ll find a few malls where you can buy name brand products, generally at full price. This is not a market, but the stores are certainly among the most well-stocked in the city. This is your place if you’re a gamer. Two places of note are Metro City and Pacific Digital Plaza. A paradise of photography and video for new purchases and repairs. The Xing Guang mall is divided into sections, and in the third you’ll also find historic pieces and truly old-fashioned instruments for fans. There is space for bargaining on prices, but clearly not with the same elasticity as with clothes, especially if these are new products. This is the first and most famous underground shopping street in Shanghai, in the heart of the city. In fact, the Hong Kong Famous Shop Street is right under People’s Square, so you can start shopping right after getting out of the metro. There are lots of shops of select quality, but with reasonable prices (market). By haggling you can get great deals. Although recently no longer in vogue, Huaihai Lu is still considered the shopping street of Shanghai. Besides 5 kilometers of first-tier stores, shopping malls, and also charming buildings that go back to Shanghai at the beginning of the century (such as the French, American and Japanese embassies and the former residence of Song Qingling). Shopping isn’t mandatory, and if you show up at IAPM and your wallet won’t let you do anything, you can just admire the ostentation and luxury. On Huaihai Road there’s also K11, an artistic institute of Shanghai. The beauty of a city like Shanghai is that you can find everything. And by everything I also mean flowers, little birds, fish and insects. Even all in the same place! This market is a typical tradition of the city, which was even repressed during the Cultural Revolution. Today it’s an interesting place to visit: the centerpiece are the crickets, that are raised both for their song and for fighting. But you can also buy pets and flowers. I recommend that you avoid coming here if you have a sensitive heart: mistreatment isn’t rare, with depressed animals crammed into small cages or owners and vendors that treat them harshly. In Shanghai there are other markets which are truly numerous; quite often, where they sell flowers you’ll also find birds and other animals. Unlike lesser markets, the Hongqiao Flower Market is spacious and decently clean. Walking among the vendors is a pleasant olfactory experience far from the stinky tofu cooked on the streets. It is considered the best place to find fresh flowers. This is decidedly the best equipped market in Shanghai in terms of flora. It is easy to lose yourself in the woods, but don’t run the risk of coming across the fauna section because it is divided. They do home deliveries for difficult purchases, help you in arranging things and offer advice. If you’re looking for cooking herbs or seeds, this is your place! Today it’s the largest Fake Market remaining after the clean-up by local authorities – together with Qipu Road Clothing Market for clothes -. At AP Plaza you’ll find the best of the best (or perhaps the worst of the worst?) of Chinese fakes. A shopping tour is a grueling activity unless you don’t want to spend more than necessary and pocket scams instead of doing good business. In general, if when you leave the vendor has an unhappy face, it means that you were able to haggle well and are paying a normal price for your product, which in reality usually hovers around 10% to 30% of the starting price. So, aim low and don’t give up. If you’re in eager expectation and/or need to prepare a wardrobe for your baby, one of the Neon Enfant Plazas are for you (that’s you plural, mom and dad). Clothes, linens, toys, furniture, a little of everything for our little ones at negotiable prices. Obviously quality is controlled closely and attentively. Yes, even in Shanghai you can get the best tea, of sought after and precious quality. Avoiding the notorious rip-offs of People’s Square, at Tianshan Tea City (or Tea Market) you can taste numerous types and in some shops you can also attend a tea ceremony. It is truly a paradise for fans. In China they make well-made glasses for cheap prices. I discovered it well after I arrived in China and all those that visited me since then went home with replacements for a year! In Shanghai, for this reason, the best place to go is International Glasses City. The risk is not being able to get out since there are hundreds of sellers and obviously an abundance of choice. Keep your eyes open for scams, I have to say. Vision exams done on site are not the most trustworthy, but they’re free, so why not. It’s better to trust previous prescriptions or the lenses you already have. As in all large cities, in Shanghai too you’re guaranteed a gastronomic variety. Here you can easily taste delicacies from all over China and the world, trusting that they are as authentic as possible to their original flavors. So here’s a selected list of restaurants (and dives!) that we like and will let you try the best food in Shanghai! OK, so you don’t know where to start; or you have limited time on your vacation; or you simply have a good appetite and don’t want to miss anything! Regardless of your motivation, throwing yourself into a food tour is definitely a great solution. There are various agencies that offer tastings, and the majority are divided among breakfasts, night market tours, housewives cuisine and something more engaging where the tourist is invited to…put their hands in pasta. I recommend two, the most well-known: Untour Shanghai Food Tours and Eating adventures Shanghai food tours. Shanghai’s cuisine is very famous throughout China. In general, they don’t hold back from using sugar. Since it’s a seaside city (even if it doesn’t give you this impression since the sea is relatively distant), they eat a lot of fish: but it’s mainly fish from the river! Among the typical dishes, “Hairy”crab, lobster, duck and a variety of dumplings, the most famous of which are the xiaolongbao. To appreciate Shanghai’s cuisine, choose Jesse (the original on Tianping Lu) or one of the chain restaurants of Xiao Nan Guo (they’re all over the city; I recommend the one near the Jing’An Temple). In China stuffed pasta is everywhere just as in Italy; often nearby cities contend over intellectual property for this or that type of dumpling. For example, Shanghai dumplings have their own version in Wuxi, with local differences. Shanghai dumplings are filled “pouches”, with pork as the usual primary ingredient. Curled at the top before cooking, they assume the shape of a little pouch, (and are therefore different than jiaozi which look more like shells); since they’re steamed in a bamboo basket their Chinese name is xiaolongbao (小笼包). They are to be eaten with care since the first bite makes the broth come out (which for the major part is made of melted pork fat) at a temperature close to an erupting volcano. 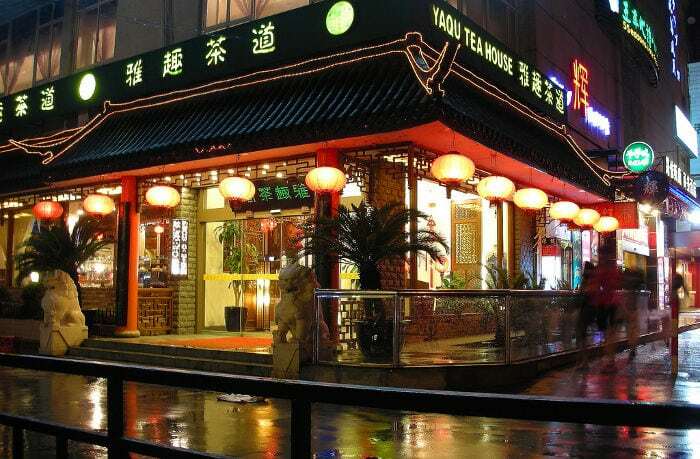 The oldest restaurant, which invented the Nanxiang xiaolongbao (哪像小笼包), is now in the Yu Garden Bazaar area. Today little is left of the shop that it was: there’s an excruciating line to get in. But the state firm that owns it has globalized and has branches throughout Asia…. In short, the dumpling has gone international. Din Tai Fung is a Taiwanese chain that serves the best steamed dumplings and noodles. Here you’ll find xiaolongbao, dumplings, baozi from the most traditional to the most sought after. The places are clean, service is excellent and prices equal to the offering. There’s guaranteed success if you’re looking for a taste not too far off from the ones Westerners are used to in their country of origin. Personally, my favorite local place is Xintiandi, where I usually end the meal with a romantic walk and glass of wine. Shouning Lu is (still) a little street surrounded by (the last) neighborhood of low, narrow houses of old Shanghai. All around are tall buildings and luxury hotels. Therefore, the small restaurants that face it, lit up by day by tacky signs, are not what you would expect in this part of the city. Especially because, if you go by late at night, you’ll find waiters seated next to stacks of crustacean shells eaten by the many clients of the day. Here’s why Shouning Lu, busy at any time of the day, offers fish street food: fried, stir-fried, stewed, live and moving. There’s something for all sizes and palates. But don’t be too sophisticated, it’s still street food. Do you have a special guest with a refined palate? Do street food and squid peeled next to the entrance not go with your evening plans? Well, then ignore Shouning Lu and head for the Grand Central Hotel Shanghai. This hotel is one of the most renowned for tasting river crab, which has the distinction of being a little hairy, and for this reason is also called “hairy crab”. Cooked, it takes on a vivid red-orange color and its meat is very tasty. Shanghai cuisine makes large use of it. This dish is made of chicken, potatoes and other typical vegetables of the Xinjiang region (dapanji 大盘鸡, or “great dish of chicken”). Keep in mind that the entire chicken is used, nothing is thrown away and that there are little bones to go through (and yes, even with chopsticks). As is well-known China is crazy about noodles, but pulled noodles are the best. They are called lamian (拉面) and are essentially long, stretchy noodles made from just cut handmade pasta. Tug after tug the noodles stretch out, resulting in noodles of various diameters being boiled and then flipped in a skillet or served in a broth. The most famous are the ones originating in the Gansu province, and in particular the capital city of Lanzhou. The majority of those who make it aren’t really of Gansu origin: but the lamian are so popular that by now they’re a consolidated business and easily altered. Usually, for no more than 20 Yuan, you can get an enormous bowl and leave more than just a little full. Figure out which one appeals to you the most looking for the words Lanzhou Lamian (兰州拉面). You’ll find them wherever you go. Malatang (麻辣烫) is a soup originally from Sichuan; it’s not a particularly elaborate dish but it is spicy. Usually, the customer chooses the ingredients from a refrigerator then all the cook does is throw them into the broth, add the requested spices, and hand back the steaming bowl and the soup is ready. There are tons of restaurants that serve malatang since as I said, it’s a very common dish. Walk around with your nose in the air in search of characters and you can’t go wrong! I personally love Yunnan cuisine, a break from the spiciness of the surrounding regions. It’s not that they don’t use hot peppers in Yunnan, but to explain you can also find dishes more similar to the cuisine of Indochina. Sichuan is a western region known for its chilies and garlic, (besides its pandas). Their dishes abound in red and white beans, boiled, stir-fried, fried: without which it’s inedible. Among the most interesting dishes is freshwater fish. It’s called shuizhuyu (水煮鱼) and this type of preparation makes its vaguely bland meat rich with flavor. Really, it should be called Sichuan hotpot, since Chongqing, before earning the role of an autonomous municipality, was part of Sichuan. So the hotpot has its origins in this region; though today, Chongqing is particularly proud of it. The hotpot or huoguo (火锅) of Chongqing is the Chinese version of fondue. A pan of boiling oil, generally spicy or really spicy, is placed in the center and those at the table cook vegetables and meat inside of it. There are different chains of hot pots. But if you’re looking for something more careful, I recommend Qimin Organic Hot Pot and Holy Cow. I’m not personally a fan of Beijing kaoya (北京烤鸭), the typical and famous Peking Duck: it has a specific sweet flavor due to a coating of sugar, though the meat, then cooked in an oven, is very tender. But you have to try this much-loved dish of northern cuisine, and in Shanghai you can do so with dignity. Usually, a restaurant’s reputation is gauged by its duck’s glaze and especially its price. Dongbei cuisine (东北) is certainly the most acceptable and similar to Western cuisine. They don’t make excessive use of hot peppers and stir-fried vegetables are among the most simple and pleasant. Dongbei restaurants are widespread, and usually have features more like a trattoria than a luxury restaurant. Let’s go beyond the borders of China to taste a very spicy and calorie-rich cuisine: Nepalese cuisine. It is a gastronomy that unites several Chinese cuisines with that of India as well, so you’ll find a lot of curry. But especially, cheese. It is here that, together with Yunnan restaurants, you can taste one of the few local Asian cheeses. Cheese balls are a real delicacy! Here’s a great place not only for sushi lovers, but also those looking for a special and refined location. Shintori is very popular in Shanghai, especially for its atmosphere and open kitchen. The sushi masters compose meticulous dishes and it’ll seem that you’re in Japan. This is also a very popular address, although the food isn’t totally true to its original flavors, Maya is the right place for looking for spicy food from other areas of the world. At times, Maya is popular with Shanghai locals because there’s an outdoor pool next door that is open to the public and busy in the summer. Though it’s really the Grand Plaza Club House, for friends it’s Maya pool. With selected seating and sought-after dishes, a creation of chef Paul Pairet: called Mr and Mrs Bund is an elegant, refined and panoramic experience (on Pudong) which your wallet is going to feel. Garlic: behind the international name for this restaurant are Turkish delicacies! There’s no place where I have eaten Middle Eastern food that comes close to the service, sophistication and flavor as Garlic. Open kitchen, attentive service, and a never-ending line. It’s best to book in advance. As was mentioned, the Park Hyatt hosts one of the highest restaurants in the world. The menu is quite varied and if your wallet won’t let you order a complete dinner, at least get a glass of wine just to get a breathtaking view above 100 Century Avenue. Tip: take this option on clear days! Honestly, my favorite Vietnamese place has closed, so this recommendation is the second in terms of preference. But this doesn’t mean it isn’t worth a visit, especially for its atmosphere and soups. Vietnamese cuisine is very tasty and delicate; often drawing from a French culinary heritage. They don’t use a lot of curry like they do in Thailand and many dishes are prepared raw. There are lots of places in Shanghai that serve American hamburgers and sandwiches. So to be remembered, a restaurant has to have a little something extra. CU2 is what you want. How could I forget? Italian restaurants are the preference; some are more along the line of a trattoria, others more sophisticated. And above all, some are really famous. The one chosen is perhaps less well known, but will certainly not disappoint your homesick palate. It’s called Nene. If you’re looking for a pizza that brings you back home with a Proustian rush, get a reservation at D.O.C. What else is there to add? Sadly it’s not rare to come across a steak that claims to be properly cooked with genuine flavors. In this aspect too, China has its fakes. So it’s nice every so often to find places that guarantee the quality of their product, which isn’t, especially in this metropolis, cheap. The best steak house in Shanghai is in the Hotel Shangri-La. This address is recommended for light lunches and tasty brunches: Kabb. They’re famous for their poached eggs. There’s a crowded one in Xintiandi, one inside the Kerry Centre and a calmer one in IAPM. Sunday mornings are nicest. Not to be confused with Mr & Mrs Bund, M on the Bund is a special place for its balcony and the views it offers. Really all places on the Bund offer exquisite brunches. But M on the Bund is a beloved classic of Shanghai; and, unfortunately for their customers and their wallets, knows it. Unquestionably the best place for French food, Cuivre though sophisticated, has the heart of a bistro with generous portions. Let’s change genres. Now we’ll discuss one of the most famous and expensive experiences in all of Shanghai, which is not just about food. Ultraviolet is a complete sensory voyage, where every course is accompanied by projections and music along with smells and lights. Dinner is reserved for only ten guests at a time, who first go to Mr. & Mrs. Bund to then be escorted to the restaurant by the chef Paul Pairet. Where this place is isn’t officially known. There are about twenty courses, each accompanied by a four dimension experience, and the price is never less than 3,000 Yuan a person. You’ll need to book months in advance if you want to take this sensory journey. Here’s a choice offering of the best night life in Shanghai. A city that’s so large and cosmopolitan can’t help but meet the tastes of all palates and ears. Because we’re also talking about music. To make it easy (fortunately), a good part of the clubs are concentrated in specific areas of the city. So you can plan your night of fun without going crazy on the subways (which, I might remind you, normally run in Shanghai up until 23, after which you’ll have to take a taxi, night buses or rented bicycles). Moreover, remember that in China the clubs close, open and move at the same speed. What might be super in vogue today, tomorrow could run into an unfortunate destiny. So always find out from the hotel you’re staying in if the place you’re interested in exists. What I’ve listed here should be considered updated and verified at the time of this guide’s writing. I’ll start with a little bar that serves every known cocktail. A place familiar with fame, it has become super crowded and requires a certain wait and patience. It’s called Constellation Bar, the original, but there are also its little twins Constellation 2, 3, 4, 5. When looking for a place in Shanghai where you can spend the entire night, many think of the relatively local club where the DJ is just an arm’s length from the dance floor. 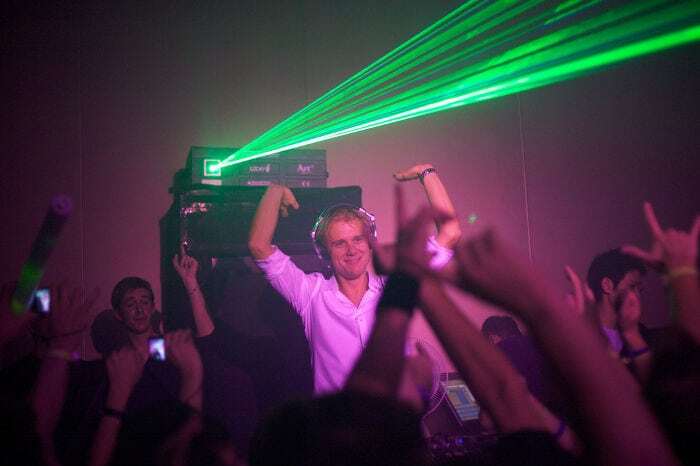 It has mainly electronic music , with events continuing into the weekend. At Dada you’ll find the best Chinese set DJs, for dancing without letup until the morning. And, an important detail, fashionable prices at the bar. When talking about rock and indie music, in Shanghai you have to be referring to Yuyintang. If you don’t like banging your head, worst case scenario you’ll find a rock concert Se non sai dove sbattere la testa, male che vada trovi un concerto rock or pogo DJ set; or a foreign band on tour. Despite being almost a dark hole with dark walls and narrow stage, it’s a city institution; and its a guarantee for coming into contact with underground Chinese musical culture. This too is an unmissable entry on the “at least once in your life” list for Shanghai. The Bar Rouge has been called one of the best bars in the world. Without a doubt the most glamorous place to show off in Shanghai: With local and highly placed clientele, virtuous and provocative dance shows, top shelf alcohol and above all, a breathtaking view of Pudong. It concludes with the latest electronic music. How should you end your night if you end in the morning? Obviously at The Mansion, which is open until 8 (and the street vendors around the area know that they can count on its famous clientele…). The DJ plays electronic music but also hip hop and techno. In the summer there’s also a pool. This is a destination for full weekends. Here’s a recently opened find that has won the hearts of residents for its convivial and international atmosphere, continuous conversation and easy socialization. The Café des Stagiaires was a victim of the closing of Yongkang Lu, in the heart of the redevelopment of old Shanghai (or the closing of too chaotic clubs, who knows). In any case its brothers opened and are plenty full. The dominant theme of this little place are video games, as the name would suggest. It offers a relaxing atmosphere but at night it wakes up with an independent music scene. On the Bund you’ll find a good part of the best of Shanghai, and being able to spend a night at a club, perhaps in a month you’ll have an idea of the hipster and party girl atmosphere of the great metropolis. The good Shanghai loves the night and begins (or ends) its Fridays and Saturdays in some part of the Bund. Don’t forget that at night it is one of the most evocative and fascinating place of the great city. So if you don’t know where to start, take a long walk when the lights of the skyline come on and the crowds of tourists rush to take selfies to post on social media – even on cloudy days, when the tops of the buildings are swallowed up by the clouds like mountains without a summit. The M1INT Club is one of the most chic clubs on the Bund, really rigorous in its politics of choosing who to let in. House music at decibels so loud so as to increase the noise pollution of Shanghai, and an incredible view from the balcony. To top it off, a shark aquarium inside. Even more chic on the refinement scale of the Bund, here’s the The Nest. However I should mention that the atmosphere is rather relaxed. Great cocktails and even restaurant service. Crowded even at night, the road is really long and starts from Xintiandi going all the way to the French Concession. There’s some of everything from name brand shopping malls to more intimate and reserved bars. Above all else, lots of restaurants, including some of my favorites (see above!). The pedestrian street that goes to the Bund is famous for shopping. And so even at night it’s very crowded and crazily lit. Some stores like to give incentives for late night sales with discounted prices. Moreover, there’s something for all tastes if you’re looking for something tasty to put in your mouth while you walk. This street is awash in stylish clubs and architecture characteristic of old Shanghai. Not by chance its in the heart of the former French Concession. Yongfu Lu extends between Wuyuan Lu and Hunan Lu. Among the most visited is The Apartment, on the third floor of Yongfu Lu 47. We’ve already mentioned about how its an area of traditional architecture, but rebuilt and a destination for shopping. Regardless the heart of Xintiandi is alive until late at night and is undoubtedly one of the most popular hangouts among foreigners. Inside its not-so-extensive pedestrian confines, you’ll find Thai food, German pubs, wine bars, and luxury hotels. Just so you get it, if you don’t know where to go and have no idea what to do for dinner, with Xintiandi you can’t go wrong. This is on the list of the best views of the city, especially if accompanied by a good glass of something (the bubbly works well for most). The Vue Bar isn’t just in a scenic position, but shows off a stylish decor: not to mention the jacuzzi on the terrace surrounded by comfortable little beds. This is the club to visit if you want a view of the Shanghai skyline but can’t afford the grand hotels in the area. The Captain’s Bar is at the top of the Captain Hostel and offers the same stunning panorama in a more informal setting. Drinks at the Hotel Puli Bar aren’t good just for its choice of wines; but also for the perfectly manicured terrace with zen garden and pond. It’s so relaxing that the torrid heat of Shanghai will almost seem pleasant. Enchanting. After the closing of the JZ Club, the Jazz Bar of the Fairmont Peace Hotel remains one of the most long-lived corners in Shanghai to listen to jazz. In particular, its musicians are probably the oldest jazz band in the city. They’ve been playing here since the Eighties and it’s a pleasure to listen to them. The new version of the renowned JZ Club is a spacious club with an ample stage, and therefore less intimate than the preceding version. Guests arrive from around the world and at times there’s an entrance fee. Still, it’s the same as ever. In reality the name of this bar doesn’t so much refer to the volume of your voice as the fact that this is a “hidden” bar, in the style of the Japanese speakeasy. In fact it is from there that the owner comes from and from there that he’s imported the style of this elegant four story club, whose prices are directly proportionate to its height. And so is the tranquility. At the bar you come in through a “secret” door. That’s what makes it great. This is the best place for watching a game with a draft beer in hand. It’s run by an Australian, so don’t expect the , although they show major international events. There are so many screens that even if you go to the bathroom you won’t miss a goal. They periodically host a “quiz night” to entertain customers. A compromise between a disco, nightclub and pub, truly challenging in terms of decor for its dominant colors. Le Baron is one of the most popular hangouts; there’s a doorman but no entrance fee, though arriving during the weekend without reserving a table is like getting into a ring. Do you want to get an spritz? Here’s a club where you can review the fundamentals of the Italian aperitif. Even when it seems as if you’ve already seen everything, the temporary shows renew, the artists flourish and the showrooms expand. And new museums are inaugurated. It’s the luck of a rich and flourishing city like Shanghai: it doesn’t hold back anything, much less art and culture that are the pride and prestige of the metropolis. An option for those with limited time and even those who are interested in a specific aspect of the city: guided tours, which not only offer company but are designed around the interests of their customers. Since its such an extensive metropolis so rich in history, you could for example enjoy the colonial era, the hidden Shanghai in the narrow roads inhabited by locals, or devote yourself entirely to the former French Concession. The Shanghai Museum is one of the best museums in China. An imposing square and cylindrical architecture that looks like a huge Chinese pot; it’s located in the center of People’s Square. It holds an accurate selection of China’s history, with enormous themed halls (ceramics and porcelain, watercolors, calligraphy, lacquer…). Entrance is free. Even though it’s always crowded, visitors spread out in the large spaces of the museum, so you can visit any time of year. How to get there: The closest metro station is People’s Square, lines 1, 2 and 8. This building exhibits the development and urbanization of the city of Shanghai: temporary expositions, photo galleries of the time, detailed reproductions of city neighborhoods; but especially a floor entirely dedicated to the Shanghai of 2020 (not too long for now) with a model of notable dimensions. As is evident in the title, this building hosts large temporary exhibits, among which is the Motor Show. Each year there’s an impressive revolving door of activities and events. The Shanghai Grand Theatre is a massive building that hosts one of the largest, best-equipped and automated stages in the world. The architecture is a work of fusion of the studio ARTE Charpentier and at night it is lit up magically. All construction was carried out in harmony with fengshui. The billboards for shows are always full and it gives ample space for international exhibitions; just to be clear, this is where they put on Broadway musicals. Tickets are sold onsite at the Shanghai Grand Theatre Box Office, while the posters can be found in local magazines. The Shanghai Science and Technology Museum has far more than I’ve ever seen in similar museums (even if not necessarily of high quality). The exhibition space is 65.500 square meters!! It’s a good idea for a rainy day for a family with children: nevertheless, as with all museums in China, they tend to be very, very disorganized, so it’s preferable to decide in advance which hall to concentrate on. There’s a bit of everything, from eugenics to ecology, from robots to botany and much more on an interactive basis. Also called the China Art Palace or China Art Museum, the Shanghai Art Museum was once located at People’s Square next to MoCA. 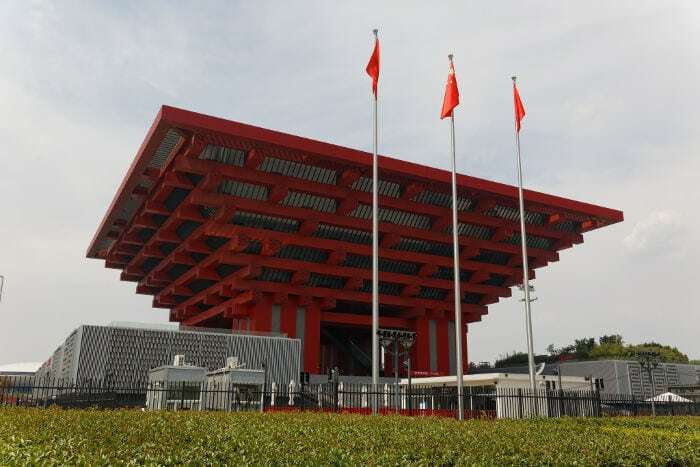 Now, its located in the former Chinese pavilion of Expo 2010, a fascinating construction of bright red, one of the few that weren’t dismantled after the event: it still holds a few records and just for the architecture is worth a visit. The Shanghai Art Museum is today one of the best museums in Asia and particularly holds a collection of modern and contemporary Chinese art, and an ample glimpse into the culture of Shanghai. A nice walk going in and out of densely packed galleries in this part of the neighborhood, right in the middle of anonymous buildings. In reality on Moganshan Road you can enjoy the best local contemporary and cutting edge productions, and why not, haggle well for purchases from young and experienced artists. This is not a residential-type artist village as is found in Beijing, even though some artists live onsite. Rather it’s a road of galleries and a hangout for artistic events. The Shanghai History Museum seeks to recreate the atmosphere of Shanghai of the past through nightly reproductions that children will find quite entertaining. Moreover, they have a collection of about 30.000 items from Shanghai’s imperial period. The museum is located inside the Television Tower. The Oriental Arts Center is the most extensive and active theater in Shanghai. It offers concerts of all sorts, from classical to jazz, ballet, lyrical and traditional Chinese operas, and in the Exhibition Hall even shows. The building was designed by the architect Paul Andreu in the shape of a flower with five petals. You can check the problem on the official site. Tickets are bought onsite or through telephone reservations (4006-466-406 or 021-68541234). The Natural History Museum is also designed for a really young audience . There are species from all over the world, insects, plants, stones and much more with about 280.000 elements on exhibit in total. It is well-stocked, to the point that it takes several hours for a real visit, time you’ll want to spontaneously dedicate to this comprehensive exhibit. All for 30 Yuan. Circus acrobatics is a Chinese tradition going back a long time. The Shanghai Acrobatic Show can be seen at the Shanghai Centre Theatre and the Huxi Grand Theatre; each obviously offers a different show, tickets vary according to section from 180 to 300 Yuan. The most well-known center though is Shanghai Circus World. L’età media degli atleti è di 16 anni e sono tutti pazientemente allenati e formati per questa attività. This private collection, housed in a nondescript building, is becoming increasingly well-known due to the diligence with which the passionate collector built up their archive of propaganda material (years 1949-1979). Personally, I wasn’t too sure about this place, but in the end I was won over by the numerous testimony of past… brainwashing and popular fermentation. Besides posters, the Shanghai Propaganda Art Centre presents photographs of the time and the possibility to buy authentic pieces. The collection is in the basement of a building so don’t hesitate to ask the doorman if you don’t find any signs. Besides giving an exhaustive representation of the incessant evolution of the city of Shanghai over time, the building that houses the museum is worth a visit. The pleasant view over Suzhou Creek is…free! Compared to the enormous buildings that house the other museums, this glass pavilion in the green heart of Shanghai almost makes a bad impression. Actually it hosts temporary exhibits of modern art that often offer a current look at the budding Asian production scene. This extensive open-air theater allows for a plunge into the past of the Shanghai reconstruction and is still used for television shoots and cinematography. It’s not unusual to come across a troupe at work. Along the same lines as American studios, these too are accessible to tourists, even if it won’t have the same effect on foreigners. Careful, the Shanghai Film Park if far outside the center of the city and the best way to get there (in an hour) is by car. The Shanghai Library is one of the largest in China, and for this reason is particularly inspiring. To access the services you’ll need to register with an identity document. It is also equipped with volumes in other languages. Here, every day, well-trained acrobats put on the show ERA: Intersection in Time: an amazing artistic composition that makes use of water, lights, plates and Chinese umbrellas and even motorbikes. It’s a beautiful experience for tourists and kids that aren’t easily bored. Don’t bother with the VIP seats, since visibility is about the same everywhere. Located on the first floor of the Longyang Maglev station, the Shanghai Maglev Museum is an informative exhibit on the history of this train a magnetic levitation that still holds several records. Among other things, is the fact that its the fast commercial train in the world. The line has been in operation since 2002. Despite its name, the Swatch Art Peace Hotel is better known as an artist residence than an actual hotel. It occupies the old location of the Palace Hotel, but should be considered as an art gallery. The residences are also open to foreigners, on this link. Quite interesting and well tended, The Shanghai Film Museum pays homage to a city that has been the cinematographic center of China since the time of Mao’s ascent. You can breathe the air of the Belle Epoque when the cinema winks at the Asian beauties with shyness. An interactive part is dedicated to the experience of the montage and voice over. In a cabinet there’s some original Awards from international festivals. The Maritime Museum is more than anything else an homage to the great voyages of exploration of Zheng He, the foremost Chinese adventurer and explorer, who visited a good part of Asia and even went so far as Europe, between the 300’s and 400’s. There’s also a nice interactive section where there’s a simulation of navigating the Huangpu and a reconstruction of the ship used by Zheng He. The museum is far from the city center, but metro line 16, finally, has made it comfortably reachable. When speaking of Shanghai, it is often said that the green heart of People’s Square is the only natural spot among the skyscrapers; rather, the city has many other green lungs. From 2016 onward, all you’ll hear is about Disneyland, the second in China if you count the one in Hong Kong. Actually, there’s are other attractions large and small in the city, and this select list will show you how to arrange your escapes from the rain, heat and stress. One of the oldest parks in Shanghai, Luxun was designed by an Englishman. It has known alternating fortunes, but now, after a clean-up it’s again newly accessible and in good shape. When weather permits, it comes alive with all the activities the Chinese love to do outdoors. With its 140 hectares, Century Park is the largest park in Shanghai. There’s all the dancing, singing and gymnastics that you would expect, plus another series of amenities that make it closer to a London style park. You can feed pigeons and rent boats just to mention two. Nevertheless, you should also expect lots of artificial constructions and amusement parks. In short, it’s a park in the fullest sense. 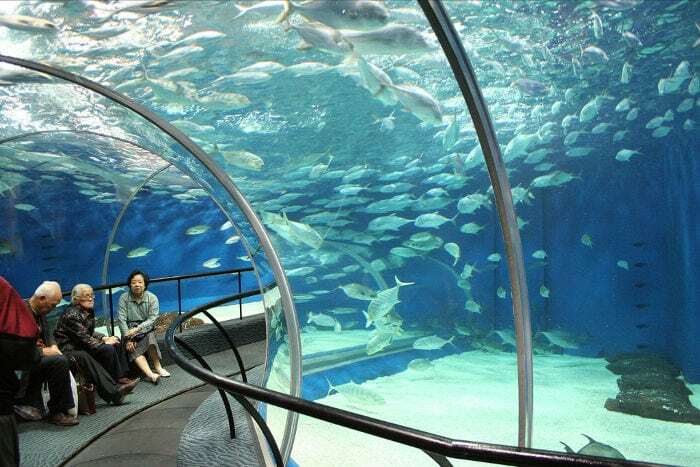 Wonderfully organized, the Shanghai Ocean Aquarium is home to the longest underwater tunnel in the world. In addition, the aquarium is the largest in China. Records aside (and the Chinese do love their records), it is a well done marine museum and has the advantage of not being too far from the center (it’s actually walking distance from the Television Tower, Oriental Pearl Tower). Interesting is the part dedicated to the indigenous species of the Yangtze River. Really huge and still not finished (at least at the time of writing): as usual, in China they do things big, and this Disney amusement park truly is. Keep in mind that it is divided into Disneyland and Disneytown, where in the latter there’s the majority of buildings housing the food court and shopping. You can come and go from Disneytown with a park ticket. To get into the park, remember to purchase your tickets in advance, and better still a Fast Pass. But despite these strategies, you’ll still have to wait on line for attractions. At night it’s just a great as during the day. This amusement park is the closest to the city center. It offers roller coasters and other adrenaline devices, along with some refreshing rides when the heat assaults the city. On clear days you can see the skyscrapers of Pudong from the ferris wheel. It’s better to go during the week when it’s less crowded. This park is just as its name says, full of trees, but all artificially planted in the center of Chongming Island, located in the Yangtze Delta. The island is connected to Shanghai by highway, so the park is easily reachable by car in an hour. It’s an interesting option to escape the traffic and stress of the city. Happy Valley is a chain of amusement parks in found in various cities in China; in Shanghai it is distinguished for being well run and offers several thrilling roller coasters, one of which is built of wood. Moreover, canyoning with a drop of 26 mt. and offering waves of 5 mt, it’s really pleasant when heat falls in the city. This green lung competes with Century Park, and is second biggest in terms of size. Nevertheless, being a bit out of the way, it’s a little less crowded, and Gongqing Forest Park features large meadows, which are generally rare in China. Don’t expect wild, untouched nature: it is an artificial park and there are a series of entertainment activities; if taking a walk isn’t enough for you then you’ll find among other things like go-karts, paintball, and horseback riding. That said, it is still one of the most “natural” places in the metropolis and easily reached by public transportation. Let me first say that I’m not a big fan of zoos and as such these are the places in China where you come across scenes of animal cruelty. The Shanghai zoo holds over 6000 species of animals mostly held in spacious enclosures; among these are the wild classics and some 600 local species. Naturally, there’s the giant panda. In short, it’s a family outing if the children are interested, but take into account the long walks between one enclosures. This is an imposing complex with interesting architecture (it can hold up to 57.000 spectators!). It’s the third largest stadium in China and host matches of the Chinese league and international events. It is not to be confused with the Shanghai Indoor Stadium. The Sheshan complex is considered the best Golf Course in China and every year hosts the WGC-HSBC. It is well-kept and much appreciated by players. A pleasant day trip for escaping the gray of the skyscrapers. At the Shanghai Sculpture Park there’s also an artificial beach. And obviously, it has statues of artistic quality. This is not a beach but a water park, the only of its kind in the city. Or better, there’s also an artificial beach. Renowned and popular for its wave pool, which is obviously its main feature. Generally the whole park is packed during the summer, so prepare for physical contact and long lines. On the other hand, it is China. Thanks for having read up to this point! If you have any doubts or questions use the comment section below! Ps. Thanks to Giulia Grigolato who helped me in choosing around thirty attractions reviewed in this article. Rita Andreetti lives in Nanjing, where she has a lot of fun. She loves movies, would like to speak a better Mandarin. Also, she writes, travels and swims a lot. Sometimes she cooks.